Last weekend saw me helping my good friend Helen out with her Big Lunch. 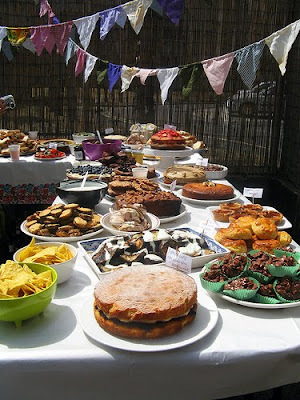 It was a completely mammoth task, pulled off brilliantly; we figured that we'd be cooking for around 30 people, and donations flooded in left right and centre from generous producers and lovely pub people. For a full list and a video of all the shenanigans, have a look at Helen's excellent post here. A particular item we made garnered lots of compliments and many requests for the recipe, so I thought it best I post it here. These brownies are properly squidgy; oozy, gooey centres, crisp shiny tops and studded with nuts. I spied more than two people slathering Rodda's Clotted Cream on top of them which is seriously indulgent, and seriously wonderful. I used to post on the BBC Messageboards, which is where I got this recipe from, specifically a user called Sue_L. She was amazing for all things baked, and though this is the only brownie recipe I've tried, it's so good I haven't bothered trying any others. There's just no need. I have, of course, made a couple of teeny weeny tweaks. Break up the chocolate and add to a bowl with the butter. Set over a bain marie, ensuring that no water gets into the bowl or you'll have a big seized mess. Once melted, take the bowl off the heat and leave to cool for 10 mins. Add the sugar in and then the eggs, 1 at a time, beating them in well as you go. Add the vanilla extract and the sift in the flour. Sift in the cocoa and beat with a wooden spoon until smooth. Chop the nuts and mix them in. Pour the mixture into a lined deep square tin or roasting dish and bake at 180 degrees C. After 40 minutes, give it a skewering to check its doneness. It should still have a little chocolate stick to the pokey but not so it's sloppy. Remove and leave to cool in the tin, and then remove and cut into squares. Serve with clotted cream if you dare. Thanks to Helen for letting me use her photos. Oh my god. I miss chocolate so much. SO much more than bread. These look effing amazing. I am seriously down with the indulgence of those with the clotted cream too - have been known to take my brownies slathered in limoncello buttercream. What? Excellent tip about the strong white flour making them chewier! V tempted to make these for the office now. OMG! They look soooooo good! I'm not usually a choccoholic but one look at that plate of brownies and I'm converted! Will have to tackle that one! I just made these tonight and they are really good. Very sweet, but very moreish. 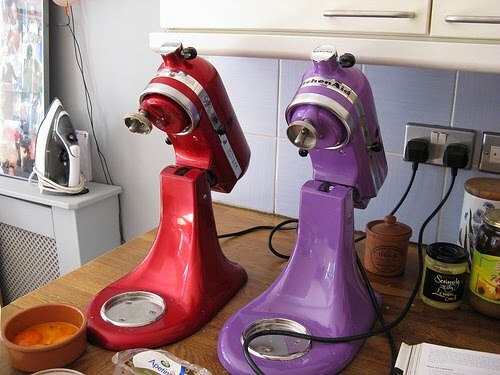 Love the pics of the two kitchenaids ready for action. By all accounts you two did a great job in the big lunch. 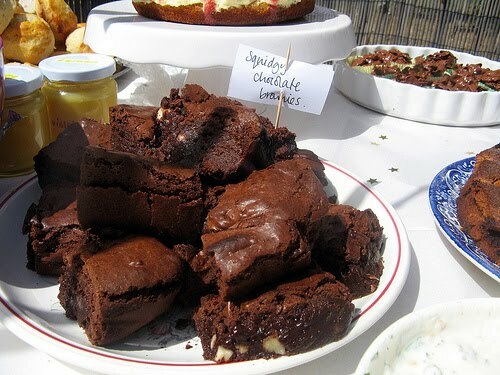 I agree - the best brownies are the squidgiest. These look incredible. I am definitely going to make these this weekend. My girlfriend is helping me move into my new flat and is doing at least 8 hours worth of driving... So she deserves them. Hopefully they'll turn out as well as yours did! Many thanks for this, keep up the good work! Gotta say, finally tackled this one this morning! The smell when they are baking is heaven! Sweet, deep dark chocolate in the air! Not ideal baking on a muggy day but still worth the effort! Had a few minor tweaks here and there - couldn't justify ALL that sugar - mind you, I didn't use the 70% cocoa solids chocolate - which would probably need the sugar! Took brownie to craft class with me and the ladies polished the lot! Think it went down ok then!? I'm not keen on brownies unless they are squidgy... so it looks like I will be trying these! Yum! Love Brownies,love the photo of the two co-co-ordinating kitchenaids(but what's in the jar next to them with the lime green label? ),love clotted cream. So glad it went well for you all, Those brownies look amazing! Well that's weird - I've just been reading about Suelle's brownies on another blog and despite being an avid reader of her blog I hadn't see this recipe until I specifically went looking for it just now. And then 5 mins later I come across this. They do look really good and I do like a squidgy brownie. Just wanted to say i made these brownies this morning and they are delicious! I used normal plain flour cos i didnt have any strong flour and they are still squishy and chewy. I made these brownies a while ago and they turned out burnt especially around the edges. I didn't over bake them and I used the exact ingredients and measurements. I'm wondering if it's because my oven is different. I have a electric fan-forced oven. I'm wondering what type of oven the original poster used to bake these brownies. Hi KellyCat. Sorry to hear that. The problem with ovens is that they never run exactly the same. I used a fan assisted oven too. Were they burnt after 40 minutes? If so your oven might be running hotter than expected and you should turn the temperature down, and skewer for doneness earlier.